A sophisticated platform sandal, with a beachy twist! Buckle these pretty shoes on and get ready to find the fun. Flirtatious raffia and seashell embellishments will dress up your favorite sundress and have you ready for every fiesta. 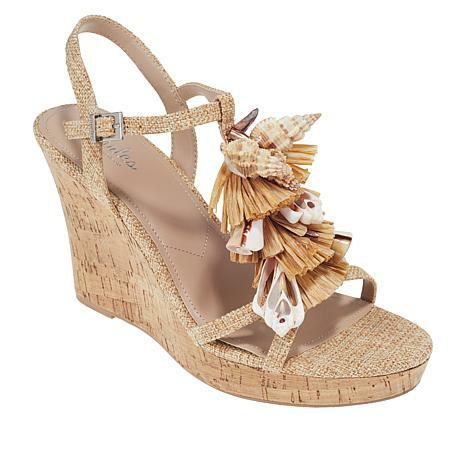 The beachy shells embellishment on this sandal are so cute, making it perfect for summer sundresses and capris. The shells are well attached and wont be falling off. The heel is a little high, but comfortable enough since it is cushy and balanced out by the platform. I ordered my normal size 9 medium and it fits perfectly. The straps are placed well and dont cut into your foot. I just had to have these because how often do you see this cute of a summer sandal with beachy shells attached? This shoe was a wild card for me. I was not sure about the platform and heel height. Not a problem! Surprisingly comfortable. These shoes were worn all day and gave me no problem! They definitely run true to size. I agree with the other post that they are a little noisy. I will also be glueing the shells to prevent them from clinking together. 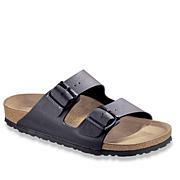 I bought these in black and in my normal size 9. They fit great and will be great for my upcoming vacation. I took one star away for the nose they make when I walk. I had to glue the shells down so they didn't clank together and move around.